Let HomCom help create easy mobility with our Portable Aluminum Wheelchair Ramp. Built from a durable, sturdy, anti-corrosive aluminum alloy, this ramp uses black frosted skidproof PVC to prevent sliding and has two high side walls to prevent accidental falls. This ramp is very lightweight and can be stored in a vehicle or at home for everyday convenient use. Transportation of this ramp is as simple as folding it in half, lifting with the handle, and you're ready to go. Max weight is 600lbs making this ramp perfect for almost everyone. Not only for use with wheelchairs, this ramp provides ease of access for scooters, bikes, motorcycles, and any other unwieldy wheeled object. 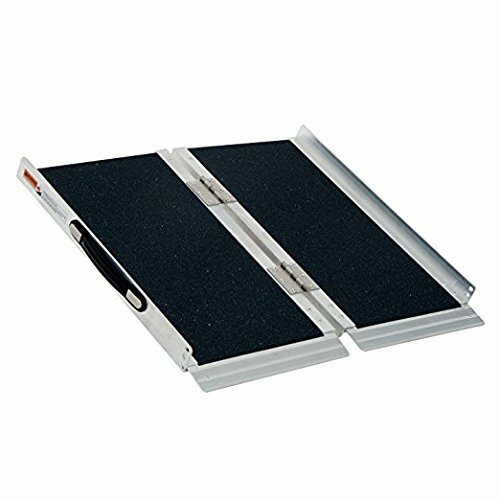 ✔ VERSATILE USES: Not only perfect for use with wheelchairs, this ramp provides ease of access for scooters, bikes, motorcycles, and any other unwieldy wheeled object. ✔ DURABLE AND STABLE: Built from a durable, sturdy, anti-corrosive aluminum alloy, this ramp has a weight capacity of up to 600 lbs, yet is lightweight enough to store and transport easily. ✔ BUILT FOR SAFETY: Covered with a black frosted skidproof PVC carpet helps prevent sliding and two high side walls prevent accidental falls. ✔ EASY TO TRANSPORT AND STORE: The lightweight, tri-fold design makes this ramp simple and easy to fold up and store in a vehicle or at home, while setup and teardown take only seconds. ✔ COMPACT AND FUNCTIONAL: When folded this ramp is compact enough to put into the back of a car or truck for use anywhere you drive.